PlayerUnknown Battlegrounds has become a global phenomenon since its release in 2016 for PC. This major success has led to PUBG Corp releasing the game for other platforms. Recently the game left the beta version for Xbox one which Microsoft celebrated by releasing PUBG themed Controller for Xbox. PUBG Mobile crossed 100 million downloads in the span of just four months which is a really short period of time for such a huge landmark. Get all the latest PUBG News only at Sportskeeda. The Franchise has now come up with another version of Mobile PUBG which is called PUBG Lite which is targeted towards lower budget phones. The game has only been released in Philipines as of now and is expected to hit the global market after some testing. PUBG Mobile has now started to dig deeper into the competitive scene with Tencent recently releasing 'Player Well Known' tournament. The game has now partnered with Mobile Giants Oppo to bring the first major tournament for the Indian Subcontinent. 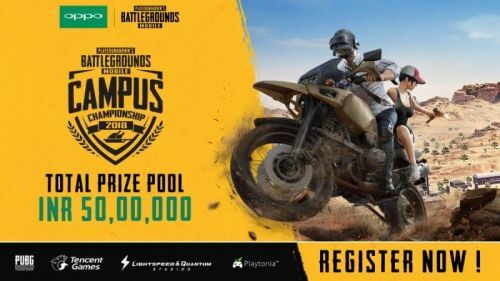 The tournament is called 'PUBG Mobile Campus Championship 2018' and will have a staggering prize pool of 50 Lakhs INR. The tournament is exclusive for college students which will cover 1000 colleges around 30+ cities. MVP - Overall Best Player with a maximum number of MVP awards. The Executioner - Awarded for maximum kills overall. The Medic - Awarded for the highest number of revives. The Redeemer - Awarded to the player with the highest amount of health restored. The Rampage Freak - Awarded for maximum kills in one lobby. The Lone ranger - Awarded for Maximum Time Survived in game. The tournament will run from September 26 to October 21 with finals to be held in Bangalore. Interested gamers can head over to the official website of PUBG mobile for more details and registration.